Discover the avenue where the richest of the Catalan bourgeoisie had their homes on Passeig de Gràcia, explore the Born, the city's most trendy district, stroll down the famous Ramblas of Barcelona, enjoy a bird's eye view of the city from the Telefèric de Montjuic cable car and relax by the sea in Barceloneta. What kind of things interest you? 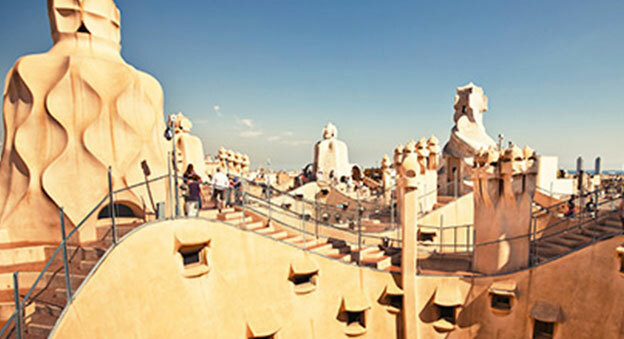 Visit the length and breadth of Barcelona without worrying about the transport element. Hola Barcelona allows you to travel around the city at your own pace in the simplest, quickest and most comfortable way. Come to the Hola Barcelona stand for any information you need. We are here at the Sagrada Familia metro station (L2). Don't miss any corner of Barcelona! We introduce you to the most emblematic places to get the most of your visit to the city. Work on Antoni Gaudí's most important project, a vast religious architectural landmark, began in 1882. This imposing church, which is still under construction today, has become a symbol of Catalan Art Nouveau architecture. When finished, La Sagrada Familia will stand 173 metres tall! Wonder at the scale and beauty of the largest stadium in Europe. Built in 1957 and able to seat 99,000 spectators, Camp Nou is the home of Barça football club. Visit this temple of football and discover its history in the FC Barcelona museum. Casa Milà, popularly known as La Pedrera, is a work by Antoni Gaudí, built between 1906 and 1912 and declared a UNESCO World Heritage Site in 1984. The Catalan architect's source of inspiration can be seen reflected throughout this unique building. Elements of nature can be glimpsed in the façade and in decorative flourishes, as the visitor is treated to a charming interior floor, going on to enter an unexpected imaginary world in its attic and roof areas. 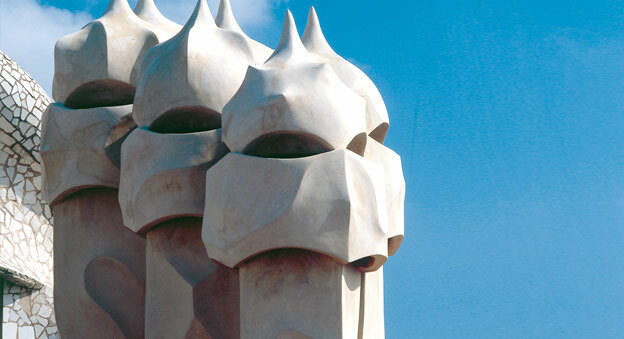 Antoni Gaudí created a magical work of art when he reformed this building in 1906. A house full of fantasy and imagination. A mosaic of coloured glass and polychrome ceramics glints from its fanciful façade and its roof hints at the iridescent scales of a dragon. A wonderful building where the sky is the limit in terms of interpretation. Commissioned by Eusebi Güell, Gaudí designed what was originally conceived as a garden city for the aristocracy, an idea that ultimately proved unviable. Now, this ambitious project has become a stunning public park featuring the organic forms so characteristic of the Catalan architect. The mosaic benches, the dragon fountain and the great columned-hall fill these gardens with fantasy. One of the most emblematic places in Barcelona can be found towering over it at a height of 500 metres: the magical Tibidabo mountain. A century-old amusement park offering fun for all ages and spectacular views of the city. Time seems to stand still at Pedralbes Monastery. Founded in 1326 by Queen Elisenda de Montcada, the convent is a leading example of Catalan Gothic architecture. The monastery as a whole, and its central cloister in particular, is a haven of peace and beauty within the city. Discover one of the best kept secrets of medieval Barcelona. The Les Corts district is home to the elegant and classic gardens surrounding the magnificent Palau Reial de Pedralbes, an estate bequeathed to the royal household by the Güell family. A spot where nature and calm unite, best enjoyed with a stroll through the grounds past sculptures, fountains and ponds in the shade of the lush vegetation. In the heart of Barcelona, Plaça dels Àngels is home to one of the most fascinating works of contemporary architecture in the city. Designed by Richard Meier in 1995, the MACBA is a rationalist building that combines straight lines and curved elements with a wonderful use of external light. Housed within the old Casa de Caritat almshouse since 1994, the Barcelona Contemporary Culture Centre (CCCB) is a leading institution on current urban culture. Its prestige is the result of the quality of its temporary exhibitions and its broad public appeal. The building offers an additional attraction, with the glass façade along one side of its central courtyard providing a reflected view of the City of Barcelona. The Antoni Tàpies Foundation is located in the building that formerly housed the Montaner i Simó publishing house, designed by architect Domènech i Montaner in 1885 and the first construction to combine an industrial typology with Catalan Art Nouveau style. Today, its facade is crowned by the Tàpies Cloud and Chair sculpture. An interesting union between functional Art Nouveau aesthetics and contemporary art makes it a must-see. Poble Espanyol is one of the important legacies the 1929 International Exhibition left behind on Montjuïc mountain. The complex was built with the idea of reflecting the rich architecture from around Spain in a single town. Today it acts as the venue for a wide variety of events and is home to more than forty craft workshops. MNAC brings together a collection spanning a thousand years of art history in Catalonia, all housed under the impressive roof of the impresionante techo del Palau, Montjuïc. Taking visitors on an exceptional journey, from tenth-century Romanesque to twentieth-century modern art. An absolute must for lovers of the fine arts. The Miró Foundation opened its doors in 1975 in a building remarkable for its functionality and simplicity of forms, designed by Josep Lluís Sert. The space is home to the most comprehensive collection of the Barcelona-born painter's work. Wonder at the artistic universe and language created by Joan Miró while taking in the building's architectural merits. A perfect marriage between content and vessel. The Maritime Museum is located in the old medieval dockyards, built in the late thirteenth century and is a magnificent example of civil Gothic architecture in Barcelona. Do you dare to venture into the depths of the ocean? Dive into the Barcelona Aquarium with a stroll through its 80-metre underwater tunnel, surrounded by the sharks and the other marine species that reside at the huge oceanarium. Explore one of the largest aquariums in Europe and the world's leading authority on Mediterranean species, home to 11,000 marine animals representing 450 different species. Located in the Palau del Mar, the Museu d'Historia de Catalunya invites you to take a fun and interactive journey through the history of Catalonia. During your visit, the museum's wonderful exhibits will take you through the region's history from its origins to modern times. Over 7000 animals representing 400 different species are waiting to be discovered at Barcelona's zoo. Come and get to know them by taking an enjoyable journey through their different habitats. The Zoo offers comprehensive facilities for the whole family and includes a petting zoo for very small children. Come and visit for a fantastic family day out! 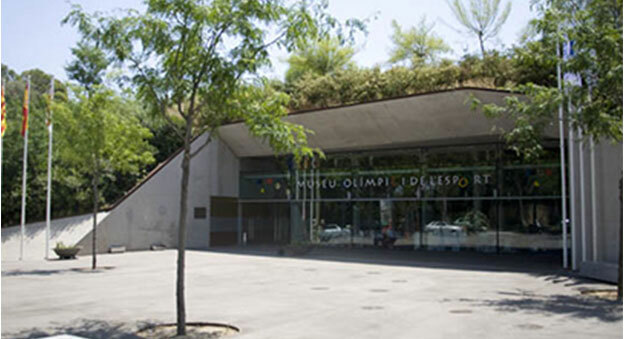 Opened in 2007, the Olympic Museum is a pioneering initiative within Europe. Cutting-edge technology takes us on an interactive cultural journey through the history of sport and the Olympics. During the visit, the museum will take you inside the different aspects of sport and the benefits to be gained from its practice. Located in the Eixample district, the Egyptian Museum of Barcelona offers the opportunity to learn more about pharaonic Egypt. A private collection of 1,000 pieces that will draw you into the life and customs of the ancient Egyptians. In addition, the museum library is the ideal space for research. The streets of Barcelona are resplendent with Catalan Art Nouveau buildings but the splendour of Modernisme extended far beyond architecture. At the Museu del Modernisme (Museum of Catalan Art Nouveau) you will discover the wealth and beauty of a style reflected in furniture, sculpture and art dating back to this artistic movement's heyday. The Museu d'Historia de Barcelona presents the history of the city from its beginnings to the present. Its headquarters, Casa Padellàs, is one of the buildings that form part of the monumental Plaça del Rei square in the heart of the Barri Gòtic neighbourhood. 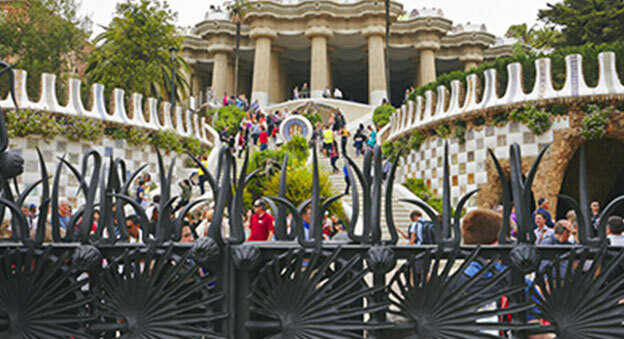 The visit evokes Barcelona's glorious past and provides an opportunity to tour the ruins of the ancient Roman city that lie underneath the museum. The Design Museum offers a permanent exhibition of over 70,000 decorative art objects, covering a period running from the fourth century right up to the present. This space integrates newly created fashion, graphic and industrial design collections, bringing together objects, the majority of which come from every day, personal and collective life. You will be captivated by the originality of the objects on display from the fields of fashion and product design. CosmoCaixa opened its doors in 2004 in the building formerly occupied by the Science Museum, a beautiful example of Catalan Art Nouveau architecture designed by Josep Domènech i Estapà. A place to discover the secrets of science through play and experimentation. Outstanding among its attractions are the Planetarium and the amazing Flooded Forest, where kids and adults alike will be thrilled by the interactive experience. Hidden away down a small alleyway off La Rambla is a very unique building, which is also the home of the Barcelona Wax Museum. A mysterious and elegant space housing an intricate waxwork exhibit featuring the most prominent figures in history. Take a journey into the past with the realistic scenes that have been created in this fascinating museum. Want to know more about Catalonia's historic evolutionary journey? The MAC is a window into the past featuring items collected from the archaeological sites around the region that provide clues to understanding both the past and the present. It is located in the former Palace of Graphic Arts which was built in 1929, with the museum founded in 1932. The MAC brings together a collection of relics that give us clues into the local culture dating back to prehistoric and medieval times. Swiss architects Herzog and de Meuron were responsible for the design of one of the most ambitious buildings constructed as part of the 2004 Universal Forum of Cultures.An indigo blue complex right next to the sea that marks the beginning of the great Avinguda Diagonal. The Museu Blau is part of the Natural History Museum of Barcelona and offers a variety of programmes and services: the permanent 'Planeta Vida' (Planet Life) exhibition; temporary exhibition spaces; the Media Library; the Science Nest for children aged 0-6 years; plus lecture rooms, a conference hall, workshops and a gift shop. Below the structure of the iconic marketplace lies the remains of a city that brings together three centuries of Catalan history. A space that provides a record of Barcelona's past from 1700 to the events of 1714. El Born Centre Cultural marks a pivotal point in time which invites us to look into the past to plan for the future. A visit to this architectural jewel of Catalan Art Nouveau, designed by Lluís Domènech i Montaner in 1908, provides a veritable feast for the senses. The prolific decoration that adorns the building's facade and interior make the Palau de la Música Catalana a truly unique proposition. Built between 1900 and 1909 by Antoni Gaudí, the history of Bellesguard is inextricably linked with that of Catalonia. The Catalan architect was inspired by the historical events that unfolded at the Bellesguard House over the centuries to create this work, a castle that combines the ruins of a medieval palace with elements of the Catalan Art Nouveau and Gothic styles. A trip on the Tramvia Blau, dating back to 1901, is without doubt the most charming way to travel up to Tibidabo. A surviving section of the old Barcelona tram lines, it runs across 1,276 metres through a suburb filled with spectacular homes and colourful gardens. Travel up to the summit of Tibidabo, with a journey back in time that gives way to nature and splendid views of the city.